The snow-flocked trees make the area picture perfect these days. The weather has turned very winterish all of the sudden! Nighttime temps are dipping into the single digits and as crazy as it sounds we are happy about it. The other night I was running some things between cabins after dark. It was one of those winter nights when everything was still and since there was no moon the sky was just blanketed with stars. Somehow the crispness of the air brought all those stars into sharp focus It was the kind of night about which Christmas songs are written. It was a beautifully “Silent Night.” I had come “…Upon a Midnight Clear” or in this case an “8:00 p.m. clear.” (We’re too tired to see midnight anymore!) How is it that in just a few short months of summer I forget how absurdly beautiful a winter’s night can be?! Most people who prefer warm weather can’t imagine that there’s anything beautiful in a night like the one I described. But I’m here to tell you there is and I hope this holiday that you get to experience “chestnuts roasting on an open fire and Jack Frost nipping at your nose.” Winter has come to Wildwood and we are thrilled! We did not get the amount of snow that those south of us received. We were initially disappointed with our measly 4 inches but really to have good conditions for snowmobiling and ice fishing in Minnesota we need good ice first. Too much snow before good ice means slushy conditions (at best) for the rest of the winter. Also I’m a bit of a ‘fraidy cat on my sled so I like knowing that before tons of snow fell there were many inches of ice on the lakes already! 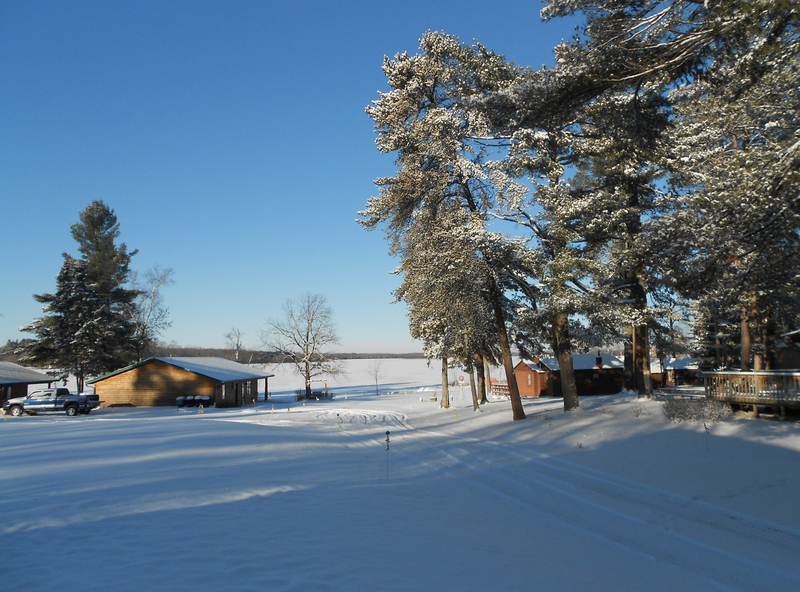 There are some permanent ice fishing houses showing up on Bass Lake this week and we’re guessing there must be around 6 inches of ice on the lake. Now it can snow….tons please….FEET even! Many Minnesota snowmobile clubs are busy beavers getting trails ready to ride so we’re hoping that by the time Christmas has come and gone we’ll be ready to hit the trails. Our phone is ringing with lots of calls from folks planning MN snowmobiling weekends or organizing their ice fishing trips to Wildwood so let the fur fly…or the white stuff in this case. 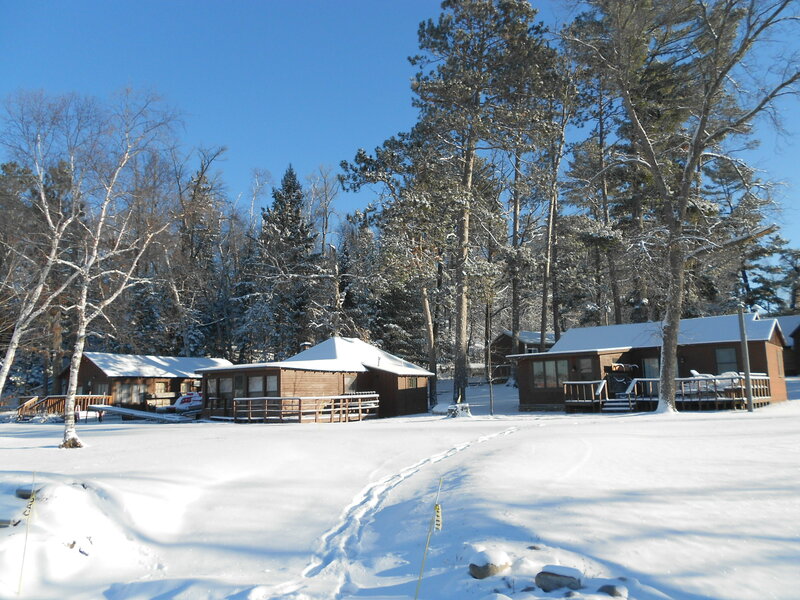 We hope that whether you stay at a Minnesota family resort or if you decide to play close to home that you get out and enjoy the beautiful Minnesota winter! 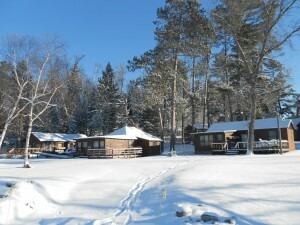 The seasonal cabins are all settled in for a long winter’s nap. With all that talk of snow and sleds and ice fishing gear some people might think that a visit to Grand Rapids is only about getting outside. For lots of people that is true. However, there is a very big contingent who pledge their loyalty to fireplaces and the warm and toasty feeling they get from one. There’s nothing wrong with that! Lots of people visit Wildwood in the winter and never leave the cabin. One year we had a group of ladies who spent a girlfriend getaway weekend in their jammies having a Wii bowling tournament. They had a ball! We have our fair share of groups who spent the weekend quilting or scrapbooking or getting massages in the cabin. That sounds pretty good, too, right?! Maybe the most balanced winter visitors are those who like a little bit of fireplace time AND some “Jack Frost nipping at your nose” time. Our area has some amazing x-ski trails – 19 to be exact – which are groomed and lighted (some of them) and we have many groups who spend their weekends skiing during the day and playing cards at night. Some of our family groups play a crazy game of football/rugby/snowball fight out on the lake and then head inside for movies and popcorn. Still others take in a performance at The Reif Center and then dine out at an area restaurant. It really doesn’t matter too much what you do….just get out and do it in Minnesota this winter. Tourism is the second largest industry in Minnesota after agriculture so consider it your civic duty to spend some fun-and-frolic time skiing, snowmobiling, ice fishing, shopping or relaxing this winter wherever you live.